Jannali, a serene suburb of The Sutherland Shire and a true gem to the locals that call this place home. And only a short distance to Jannali Village and train station, is this villa style home that is set in a tranquil family friendly complex. An ideal purchase for growing families, downsizers and investors alike. This single level villa is a perfect opportunity for anyone wanting to get into the Sutherland Shire Property Market. Easily keep moisture and mould away with this low maintenance household. Plenty of airflow throughout the home and natural light, makes this property an ease to keep clean and dust free. Boasting 3 large sized bedrooms that are all complete with built-in wardrobes, makes this magnificent home seem much larger from the inside. Each bedroom is complemented with a garden outlook into the courtyards, with the main room looking over the front yard. Clean and looking pristine, the bathrooms are pleasantly updated for modern times without compromising on style. The main bathroom is easily accessible for family and guests, while the second bathroom joins with the master bedroom as an ensuite. A decent sized kitchen that overlooks the open plan living and dining areas, makes this a great entertainment space for the family and friends. Proper and fitted with gas cooking, stainless steel appliances and plenty of bench space. This cookery is perfect for those who enjoy cooking up a storm and preparing delicious food to share with family and friends. These two grand and copious courtyards add more entertaining area to this already large and spacious home. 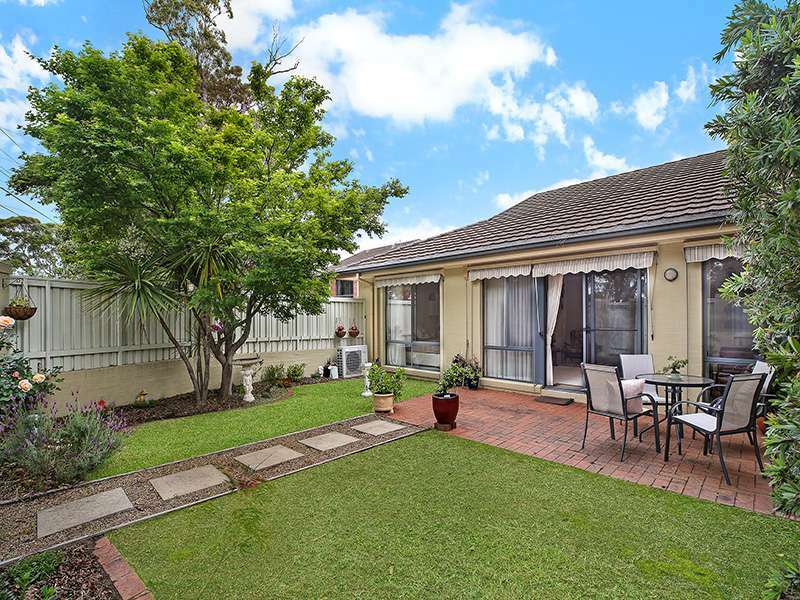 An ideal spot to play some backyard cricket or light up a BBQ for a hot summer in The Sutherland Shire. You can bet that the lifestyle that this villa provides is surely one to be enjoyed. Met with private gate entrances on each end of the property, both courtyards are easy to access for the household and guests. With a lock up garage that has internal access, homeowners can easily get into their car’s on those rainy days. And for those that need that extra parking space, there is an additional parking area in the front of the garage which is secured by a gate. Also, there is plenty of storage in the garage, so you can put away other household items that you need the extra space for. Popular for working professionals, due to its convenience to get to the CBD by public transport. Jannali has always been a popular area to live in for families and couples. As so is this villa situated in a serene family friendly complex, which is only walking distance to Jannali Village, station and other amenities. Don’t miss out on this great opportunity to invest into the one of The Shire’s most beautiful suburbs Jannali. Or you can simply call Sebastian Viteri or Derin Hill on (02) 9545-2220 from Hill & Viteri Property your Local Estate Agents.